Our new workshops series for Spring 2019 is live! Interested in learning to code in R or social media scraping? Looking to sharpen your Tableau skills? Curious about GIS and Geocoding? Check out our spring line up! 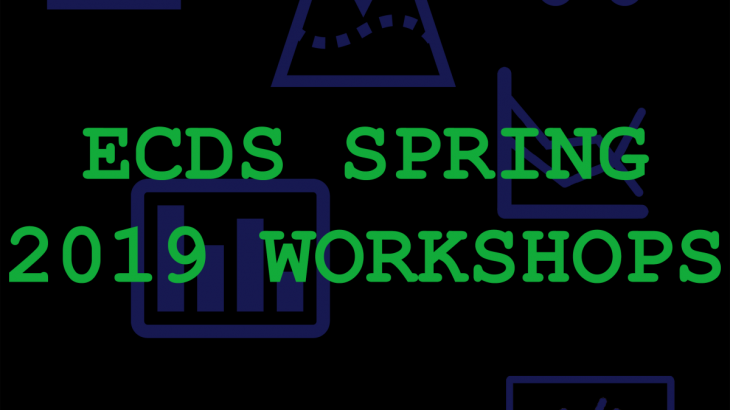 The Emory Center for Digital Scholarship (ECDS) is partnering with the Institute for Quantitative Theory and Methods (QTM) at Emory College of Arts and Sciences again for Spring 2019 to provide workshops for our Coding in R series. This series takes participants from the basics of coding in R through more advance topics to a workshop focused on social media scraping in R. The second half of the semester will showcase workshops on network visualizations, working and publishing in Git and GitHub, a new advanced in Tableau workshop, and data cleaning. This semester we will run our GIS workshops series again covering basic topics and some new material. The workshops will introduce users to Esri’s ArcGIS Desktop and the new ArcGIS Pro software, as well as the free and open-source alternative, QGIS. We’ll cover common tasks in working with spatial data and creating maps. There will also be a workshop devoted to the popular question of geocoding, or how to turn street addresses into latitude/longitude coordinates. Basic workshops in ArcGIS and ArcGIS Pro will be offered twice in January and February. The rest of the workshops on QGIS, Geocoding, ArcGIS Online/Esri Story Maps, and SimplyAnalytics/Social Explorer/Policy Map will be offered only once. If you have any questions about our workshops, send us an email at ecds [at] emory [dot] edu.